Eurypharynx pelecanoides, 90 cm head to tail. We made two versions of this species. One for Senckenberg Museum of Natural History in Frankfurt and one for The Blue Planet in Copenhagen. Thanks to Peter Rask Møller, SNM and Theodore W. Pietsch. 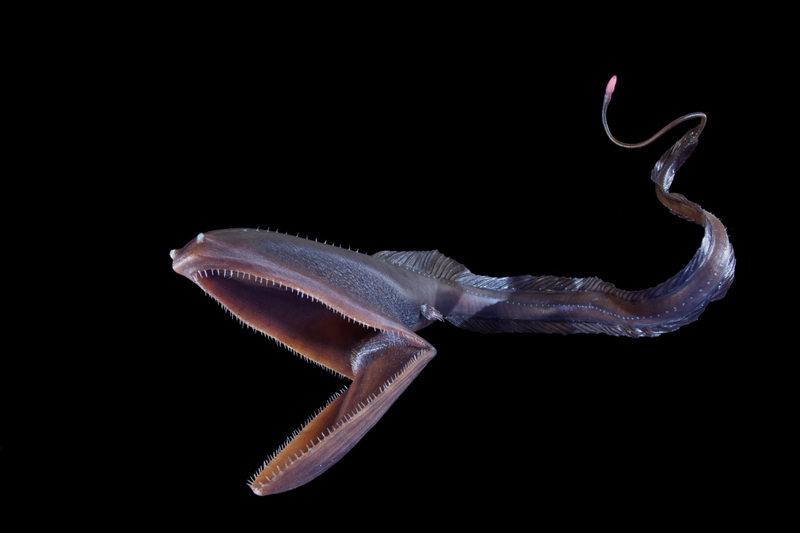 This extraordinary looking deep-sea fish goes by the names gulper eel, pelican gulper, pelican eel, and umbrella-mouth gulper. The names are derived from its most notable feature: Its large mouth. The pouch-like lower jaw resembles that of a pelican, and is much larger than the rest of the body. The jaw is loosely hinged, as seen in modern snakes, making it able to be opened extremely widely. Even though the stomach can stretch and expand to accommodate large meals, stomach content analysis suggests Pelican Eels primarily eat small crustaceans. Contrary to some deep-sea fish, Pelican Eels have tiny teeth, implying that the large mouth is probably used like a large net; The Pelican Eel can swim into a group of shrimp or other crustaceans with its mouth wide open, scooping them up as it goes. When the eel gulps its prey into its massive jaws, it also takes in a large amount of water, which is then slowly expelled through its gill slits. The Pelican Eel is the only known member of the genus Eurypharynx and the family Eurypharyngidae. It belongs to the order Saccopharyngiformes, which is closely related to the true eels in Anguilliformes. Contrary to true eels, gulper eels lack pelvic fins, swim bladders, and scales. Unlike many other deepsea creatures, it has very small eyes. It’s skin is pitch black, and it grows to 75 cm in length. They are found in temperate and tropical areas of all oceans and lives in depths from 500 to 3000 metres. 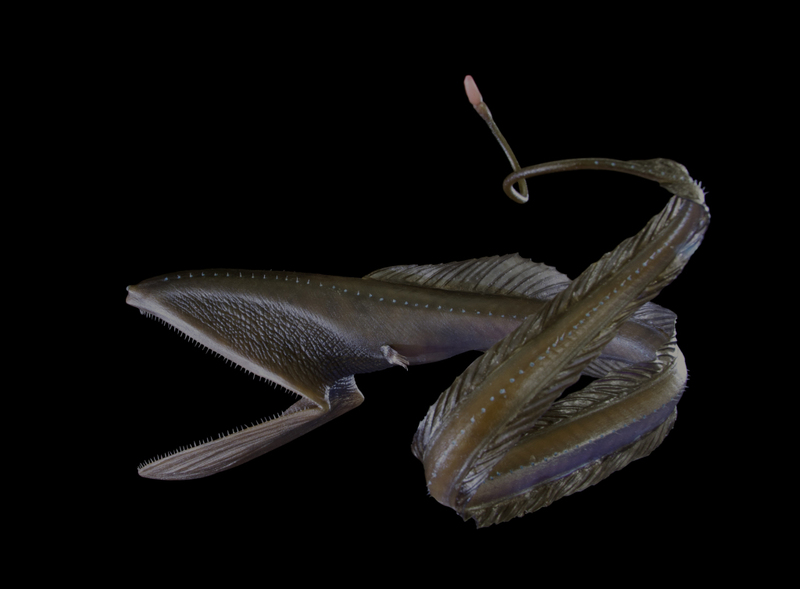 The gulper eel uses its long whip-like tail for movement. The end of the tail bears a complex organ with numerous tentacles, which glows pink and gives off occasional bright-red flashes. 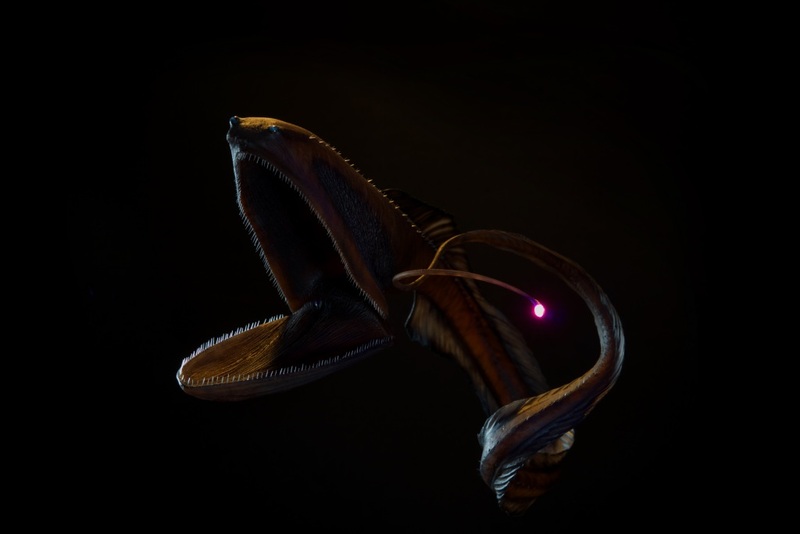 This is presumably a lure to attract prey, although its presence at the far end of the body from the mouth suggests the eel may have to adopt an unusual posture to use it effectively.